After years receiving treatment at Shaare Zedek children's hospital, 80-year-old rabbi gifts Bible edition that took him decade to write. 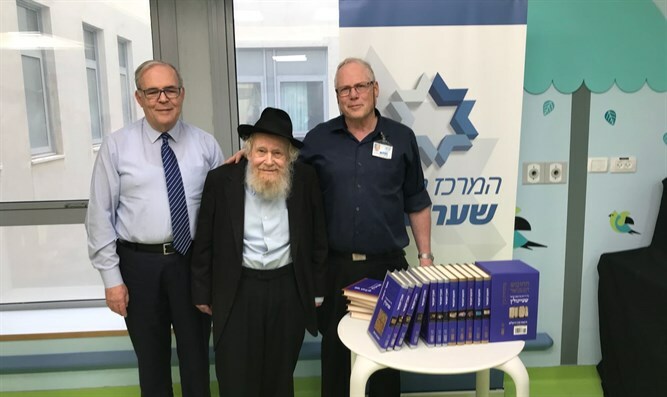 Rabbi Adin Even-Yisrael Steinsaltz, 80, arrived at the Shaare Zedek Medical Center today to present the hospital with a newly completed edition of the Bible with a commentary he wrote. Rabbi Steinsaltz, who has been treated in hospitals for the past 30 years, donated the book set to the school library of the Wilf Children's Hospital in Shaare Zedek. Present at the event were the medical center's director Prof. Yonatan Halevi, and the Children's Hospital Director Prof. Yechiel Schlesinger. 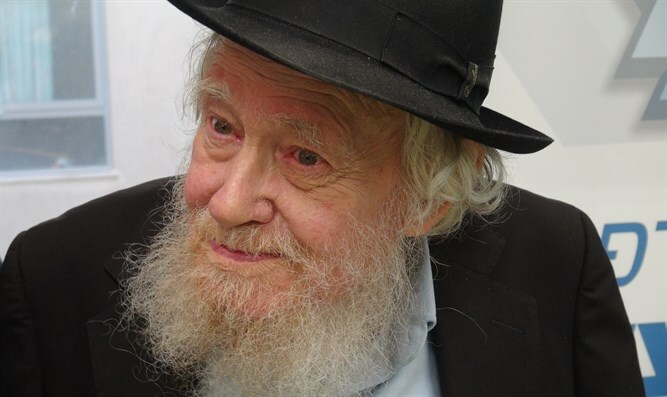 Rabbi Steinsaltz, one of the greatest Jewish intellectuals of our generation, has for years interpreted and explained Judaism's fundamental works. After completing his commentary on the Babylonian Talmud, he wrote a comprehensive and up-to-date commentary on the Book of Books. The rabbi completed the annotated edition of the Bible after intensive work that lasted over a decade and is published by Koren. In his childhood, the rabbi was diagnosed with the rare Gaucher disease and was treated for decades at Shaare Zedek Hospital in Jerusalem, where he was regularly treated in the Pediatric Day Care Unit. Even when a separate ward was opened for Gaucher patients where treatment was available, the rabbi insisted on continuing receiving treatment in the pediatric ward, where he used to sit, read, and talk to the hospitalized children. The rabbi spent many hours perusing the books in the library and waited for an opportunity to contribute his own book to enrich diversity. The Talmudic books and his writings were less suited to the colorful shelves of the children's library. The rabbi is in a long rehabilitation process after a stroke about a year ago and was excited to meet the dedicated staff that treated him and helped him as well as the young patients. The rabbi thanked the staff for their devoted care throughout the years and wished the sick children a speedy recovery and a happy holiday.